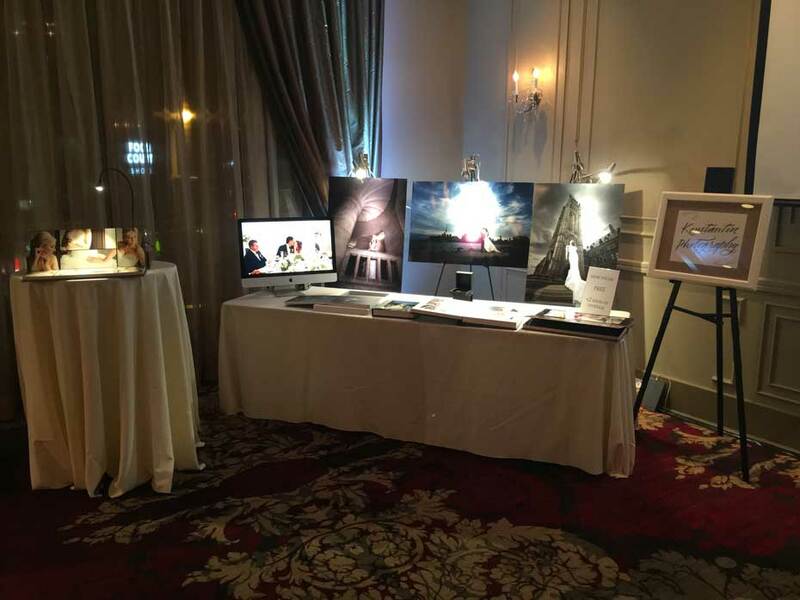 Konstantin Photography recently participated in the Terminal City Club’s Hush Wedding Soirée 2016. This year marked our second year in attendance at this small, upscale show, and it was a privilege to connect with so many soon-to-be newlyweds! The event took place on March 5, 2016, at the Terminal City Club in downtown Vancouver, BC. Those in attendance received wine, champagne, Hors D’oeuvres, beauty treatments, live entertainment, bridal swag bags, and an entry to win the Hush Wedding Soirée Honeymoon Grand Prize. Thirty of Vancouver’s top wedding professionals were there, including vendors in categories such as beauty, bridal gowns, destination wedding and honeymoon, music and entertainment, and transportation. It was an honor to be among these prestigious Vancouver wedding vendors again this year! The Hush Wedding Soirée offers an intimate wedding show that sets the stage for opportunities for networking in an elegant atmosphere. Instead of experiencing a traditional trade show, guests enjoy even more one-on-one time with vendors. Plus, vendors roll out the red carpet and offer their best deals, packages, and exciting offers during the Hush Wedding Soirée. The Terminal City Club again transformed its two floors into a symphony for the senses, offering lavish decor, refreshments, roaming brides, and plenty of inspiration to help guests define their very own, unique wedding style enhanced by the services of Vancouver’s best wedding vendors. The encompassing goal of the Hush Wedding Soirée 2016 was to help soon-to-be newlyweds find a style as unique as their love, and we think the event hit the nail on the head. The evening event offered an elegant, small-scale charm that couples visibly loved, as they do every year. We were able to talk to couples one-on-one, taking our time to get to know each individual and discuss their specific needs and desires. At the end of the day, we were able to provide better insight into each couples’ needs due to the quiet type of environment offered by this particular show. While many shows are held across the day, many of them lasting from the morning hours through the late afternoon hours, the Hush Wedding Soirée is an evening show, which makes it distinct. Its elegance combined with the Terminal City Club’s complimentary bubbly certainly makes for a memorable, high-class evening. For the Hush Wedding Soirée 2016, Konstantin Photography offered our booth’s visitors their choice of 10% off our services or an additional two hours of coverage at no extra charge, and we know that both of these offers provide a great deal of value to soon-to-be newlyweds who are starting new lives after the big day! The money saved on photographs means that they still get the professional photos of their wedding day that they want without sacrificing the things they need on that day and beyond. We are extremely proud to be able to offer that to the soon-to-be newlyweds that we meet at wedding shows over the course of the year. This year was the Hush Wedding Soirée’s fourth consecutive year presenting Vancouver couples with an upscale way to learn about the area’s best wedding professionals. It was such a pleasure to be among that elite group for the second year in a row! We certainly hope to have the honor again another year and look forward to further serving engaged couples across Canada time and time again with our professional services. We’ve taken the time to specialize in wedding photography, and we are humbled to be students of our profession, always learning and growing and excited to meet each new client! Tagged soiree, tcc, terminal city club, wedding show.